Faulty wires –worn electrical cords, old or poorly maintained systems, and faulty wiring are a major cause of commercial fires. Smoking –it takes just one cigarette to start a fire. Even smoke-free buildings are at risk. Improper storage –storing flammable materials too close to a heat source. Improper maintenance of heat sources –your forge, furnace, stove, or oven can easily cause a fire if not used properly. You need your monitored smoke and heat detectors to cover these high risk factors. Correctly installed and routinely serviced fire detectors are crucial. You’ll gain peace of mind while Secure Pacific’s experts monitor your facility for fire. Secure Pacific monitors smoke and heat detectors, sprinkler systems and pull stations, and quickly dispatches emergency personnel to your facility. 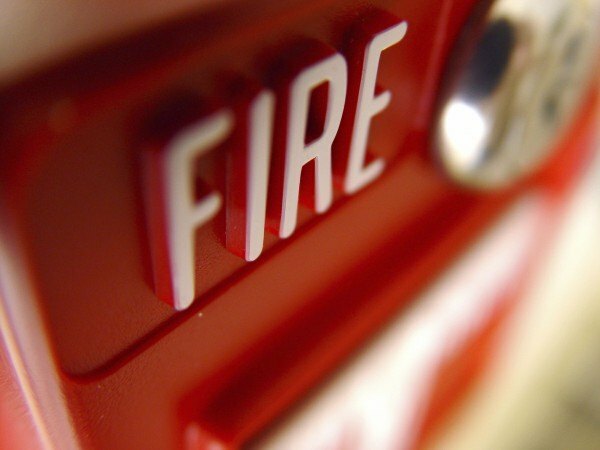 Fire alarm systems in businesses can significantly reduce injuries and property damage from fire. They quickly identify a developing fire and alert the people in the building and fire department before extensive damage occurs. Secure Pacific can provide systems monitor for fire. Our operators monitor fire detectors and stay alert to your safety. Our fast response can save lives and minimize losses.